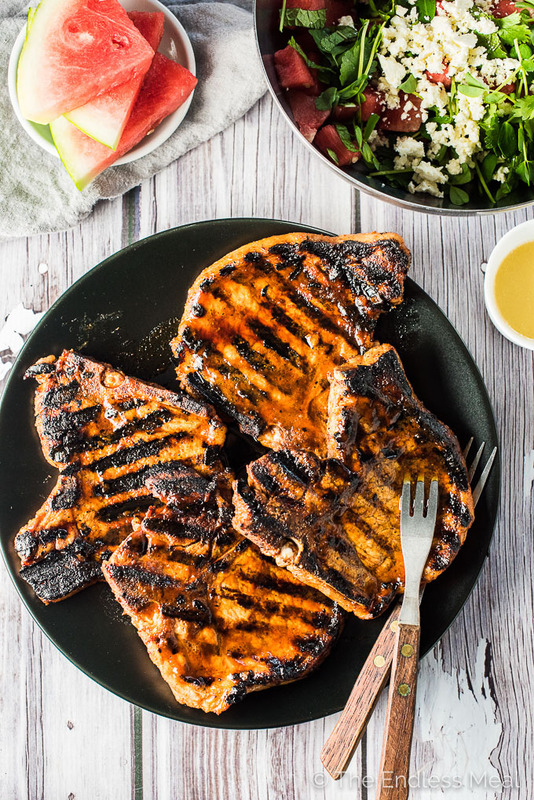 Grilled Gochujang Pork Chops are a delicious and healthy summer BBQ recipe. They are marinated in a sweet and spicy Korean chili paste then grilled to perfection. 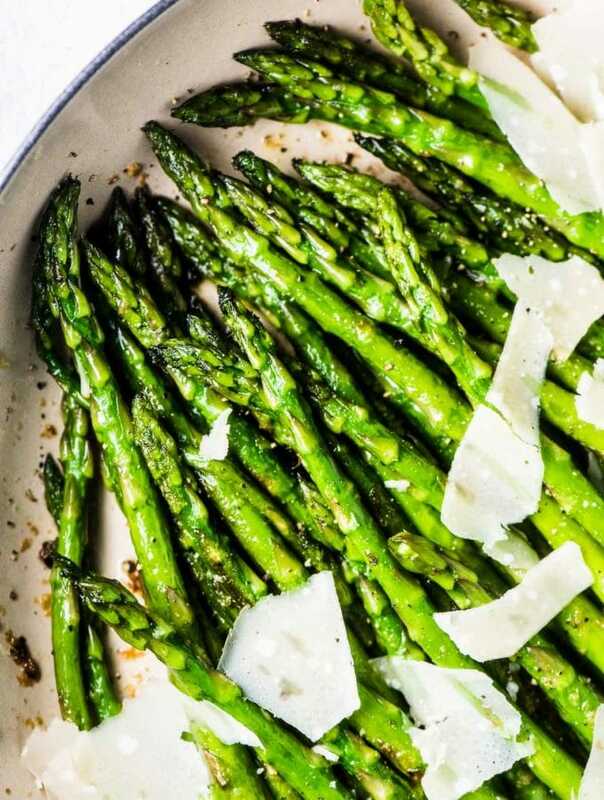 Serve them with a side of rice (or cauliflower rice!) and a simple mint watermelon salad for an easy and healthy dinner recipe. Friends! This recipe is screaming summer all over the place. I mean HELLO, there's watermelon! Sweet, juicy, delicious watermelon. Does anything say summer more than watermelon juice running down your hands? ? Before I tell you about these aaaamazing Gochujang Pork Chops I have to tell you what happened after dinner last night. When we got up from the table I gave my little girl one of those slices of watermelon you see in the pic below.? While we washed dishes, she sat in her highchair being super quiet and totally unlike herself. When she finally started babbling again I went to get her and the ENTIRE piece of watermelon I have her was gone. She ate the whole freaking piece! Like, ALL of it. Even though I've read pickled watermelon rind recipes I still had to ask Google in a bit of a panic if she had eaten something poisonous. I'm mean really, who the heck eats a watermelon rind? Ha! It's like she thought she was starving and hadn't just eaten half of one of those pork chops. These babies are marinated in a sweet and spicy Korean chili sauce called gochujang. You might have guessed that by the title of the recipe. Have you tried it before? It's shown up around here a few times. There were those Sweet Korean Paleo Chicken Thighs, the Crock Pot Korean Gochujang Pork, the Gochujang Pulled Pork Korean Pizza, and it even showed up in the Skinny Bang Bang Cauliflower. Honestly, it's one of my favorite seasonings. It's got this smoky/ sweet/ spicy thing going on and is super flavorful. Even though it's a chili paste, it's not overly spicy so you can use quite a bit of it. In this recipe, I've used 2 tablespoons, which give the pork chops a tiny bit of heat and a lot of flavor. After the marinade flavors the pork, you're going to boil it for 2-3 minutes to turn it into a Korean BBQ sauce. You'll take that tasty sauce and pour it all over your rice and love your life with each bite you take. 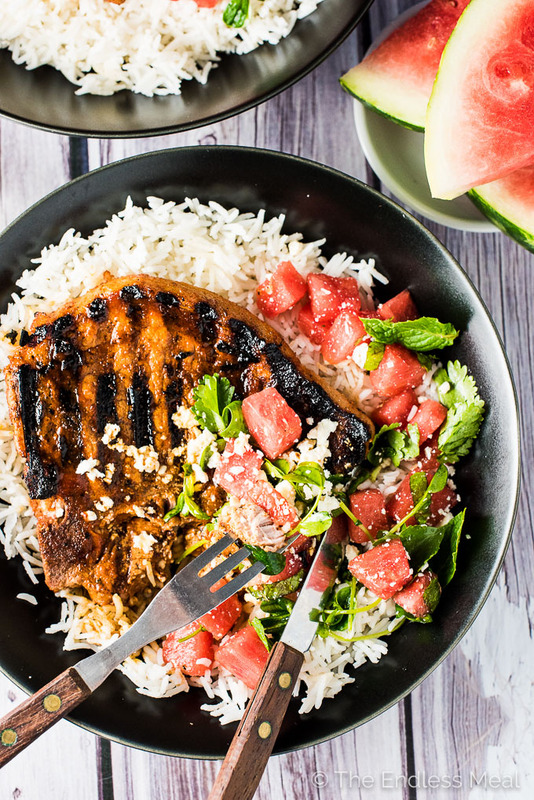 The spicy Korean BBQ sauce covered rice + the cool watermelon salad is just about the best combo ever. I'm a little embarrassed to admit that this is the VERY FIRST watermelon recipe on the blog. Can you believe it? Seriously, what the heck is wrong with me? I promise I'll change that this summer! It might seem like a bit of an oddball combination to serve meat with watermelon salad, but it totally works. 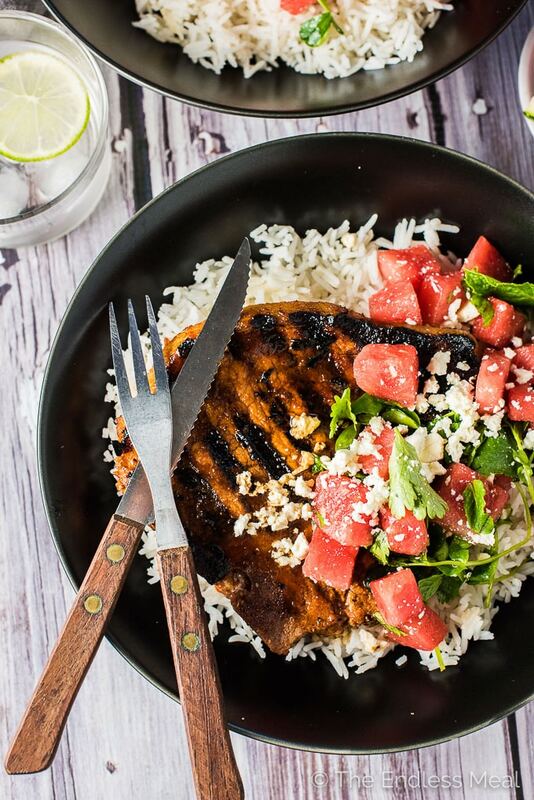 The sweet watermelon helps to cool the spice in the pork chops and goes so well with the smoky grilled flavor. It's summertime on a plate. 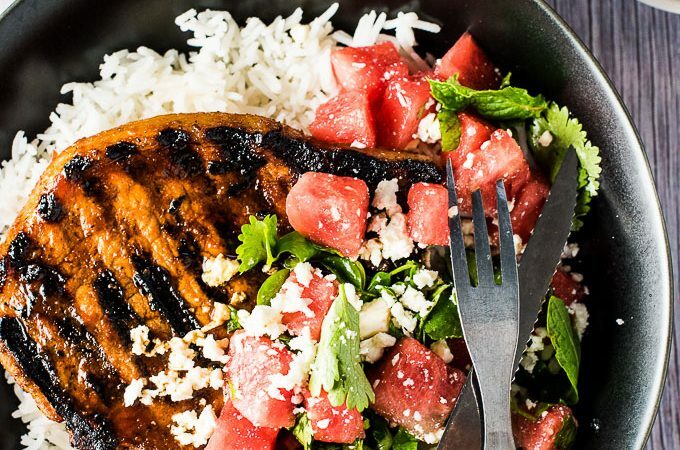 If you make these Grilled Gochujang Pork Chops with Mint Watermelon Salad makes sure you snap a pic and tag #theendlessmeal on Instagram so I can like and comment on your photos. I love seeing TEM recipes you create! In a medium-sized bowl, whisk the rice wine vinegar, gochujang, honey, oil, and soy sauce. Place the pork chops in a resealable bag and pour the marinade in the bag. Seal the bag and squish it around a little so the pork chops are covered in the marinade. Place them in your fridge and let them marinate for 1-12 hours. Oil and heat your grill on high. You want your BBQ as hot as it can get. 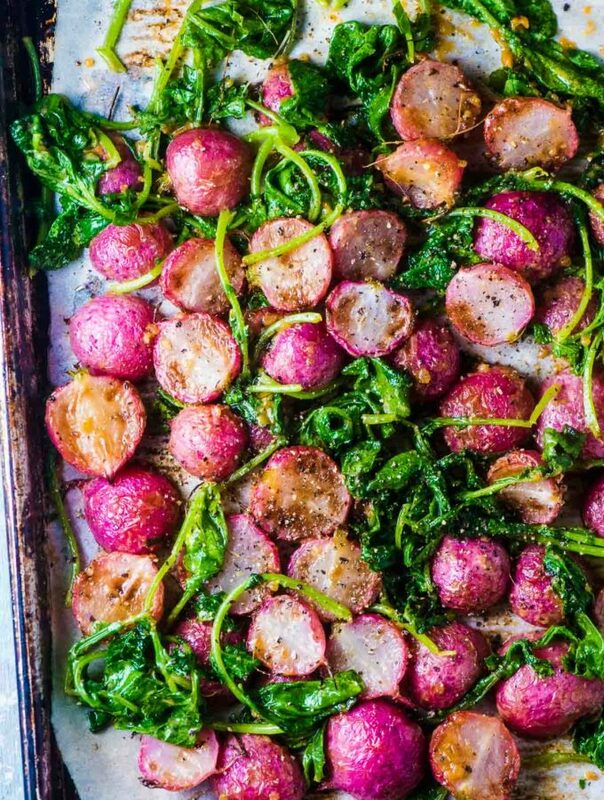 While your BBQ is preheating, make the rest of the dinner. Note: if you are serving this with rice or cauliflower rice, make that now. In a small bowl, make the salad dressing by whisking the rice wine vinegar, honey, oil, and salt. Place the watermelon, mint, cilantro, and feta cheese in a medium-sized bowl. Take the pork chops out of the marinade and pour the marinade into a small frying pan over high heat. Rapidly boil the marinade for 2-3 minutes, or until it has thickened and looks like runny BBQ sauce. Grill the pork chops for 3 minutes per side. Toss the watermelon salad with the dressing. Dig in! Some people who follow the paleo diet eat cheese, others do not. If you do not, leave the feta out of the salad. Hi, I made the Gochujang chicken thighs and they were outstanding. The fam absolutely loved em and totally devoured them! Luckily I doubled the recipe! I was wondering, for the porkchop recipe, what is the type of oil you use? Is it sesame or olive… or does it matter? What a genius combination! I could seriously go for some savory watermelon usage right now, and I hate to admit I’ve never posted a watermelon recipe, either! Leo loves watermelon, too… I used to give him giant slices when he was teeny and he’d just sit there and somehow balance it and gnaw and gnaw and gnaw. Ha! 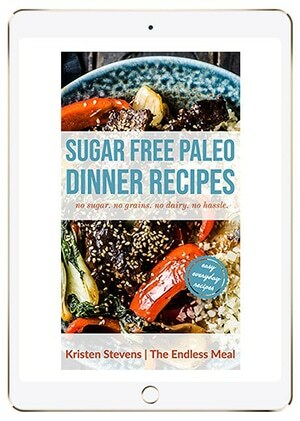 I’d love to try this, and I am definitely looking into that paleo gochujang recipe! I love that your little one loves watermelon as much as mine does! It’s so so good! !